Here is an exciting variant to the classic British Fish & Chips. Using the batter to play with the flavour is key - we used a classic nut and spice blend called Dukkah, plated with potato skin style russets. View the complete recipe below. In pan, toast cumin, coriander, fennel, sesame seeds until slightly golden colour and fragrant, remove and cool completely. Toast all nuts in the oven and cool completely. Crush nuts and spices and add Knorr Vegetable Bouillon. Soak your chips in cold water for 5mins or so to remove starch. Rinse well under running water then simmer them in salted water for 7-9mins. Chips should still hold its shape. Drain them well and lay them onto baking tray. Put them in the freezer for 30mins or so to dry them out. Heat your frying oil to high temperature and fry the chips until lightly coloured. Now, place your chips on a baking tray in the oven at 180°C and bake them for about 20 mins or until chips are dark golden brown around the edges. Do the batter Before 20 minutes of frying the items. Gradually add the iced water and with a fork, mix the batter, best if flour lumps I little. Add more water if needed for. Dust the fish with flour & Knorr Vegetable Bouillon before coating in the batter. Dip the fish in the batter and then in the dukkha mix. Fry at 180°C until golden brown. 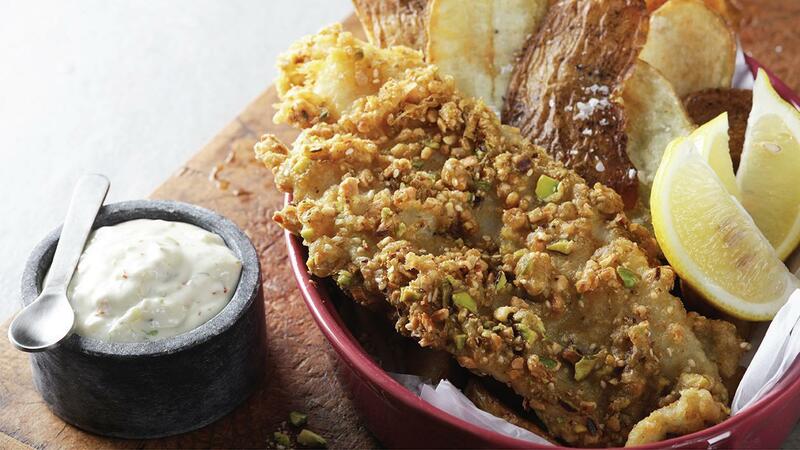 Serve with the homestyle russet chips.